The lake in the county park has no name other than ‘the lake in the country park’. 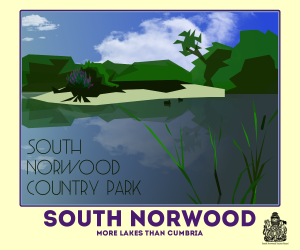 This often leads to confusion with South Norwood Lake – the other jewel in our LAKE DISTRICT. SNTB aim to rectify this by naming the country park lake as ‘LAKE CONAN’ after our most famous resident CONAN DOYLE – there being little other commemoration of him in South Norwood. We shall seek the support of the Sherlock Holmes Society and aim to have the naming ceremony in the autumn attended by hundreds of Holmes look-a-likes from all over the world.